The Office for National Statistics (ONS) have made recommendations for the content of the 2021 Census, which was published in a White Paper titled, ‘Help Shape Our Future: The 2021 Census of Population and Housing in England and Wales’. Secondly, the SFUK say we are an ‘ethnic’ group because of Mandla v Dowell Lee. The case involved a schoolboy discriminated against by his school for wearing his turban. When it went to the House of Lords they for the purposes of the then Race Relations Act 1976, ruled Sikhs could conveniently fit into an ‘ethnic origin’ box based on a few tests, like sharing common language, culture and geographical descent – this is because religion wasn’t protected under law at the time. If you apply the same tests today, Sikhs wouldn’t necessarily fit in the ‘ethnic origin’ box, because most Sikhs today are British born and speak English as a first language. Moreover, the Race Relations Act 1976 has been repealed in its entirety, and replaced by the Equalities Act 2010, in which all religions are equally protected from discrimination. In any case, from a doctrinal perspective, Guru Nanak was the founder of a great world religion, not an ‘ethnic’ group. Sikh teachings reject division of society on grounds of caste, creed. colour and by the extension of this debate ethnicity. 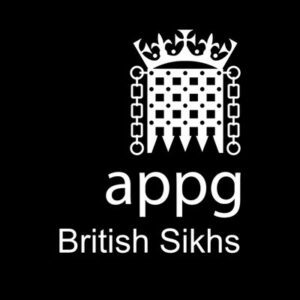 We’ve seen a communication from the APPG for British Sikhs in response to the ONS decision, and it’s clear the SFUK and Preet Gill MP are upset and angry. They have put a lot of effort and energy into lobbying. 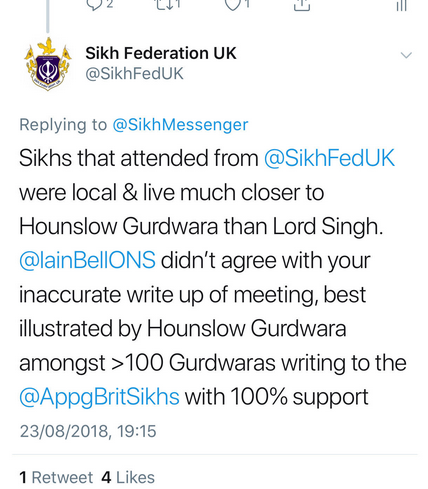 On August 23rd 2018 (at 19:15) the SFUK put out a tweet suggesting Hounslow gurdwara (Alice Way) was one of the gurdwaras which supported their campaign with a letter written to the APPG. 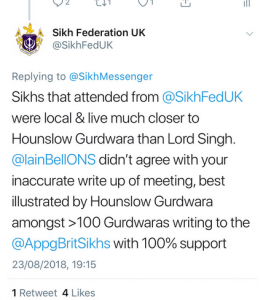 [iii] We asked the Hounslow committee if this was the case or not, and they informed us they did not support the APPG and believe Sikhism is a religion not an ethnicity. They had also made this clear in a meeting with the NSO, SFUK and Iain Bell from the ONS. 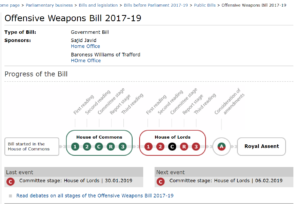 Given the SFUK announced 112 gurdwaras have supported the APPG, and this figure has been reported in the press and provided to the ONS, we would like to see 1. The briefing given to gurdwaras by the APPG 2. Redacted versions of the letters received 3. The specific question asked to elicit a response. We have serious concerns that gurdwaras may have not been provided with a balanced view of the subject matter, which could lead to survey bias, and if there are 112 gurdwaras signed up in the first place. The APPG have alleged the ONS has ‘misrepresented’ the survey of Gurdwaras they conducted. [iv] This is a serious allegation and given what we know about Hounslow frankly risible. Secondly, they go onto to claim the survey and response from 112 gurdwaras have an official membership of 107,000 and an estimated congregation of 470,000. How they came to these figures is not clear, however we can see that 470,000 is a larger number than the total population of Sikhs from the 2011 Census (423,000). [v] 112 gurdwaras is approximately 1/3 of the total number in the UK,[vi] so the suggestion is that more than the total population of British Sikhs (up to 2011) attended a fraction of UK gurdwaras. It is not clear whether the figures include overseas visitors or non-Sikhs coming to gurdwaras, or gurdwaras in Scotland which has a separate Census. They suggest 100% of gurdwaras that responded to their survey did so as an ‘independent decision’, however this again is unclear, until we see the particulars of the briefing provided to them by the APPG. He describes the various options for Sikhs who may want to say they are ‘ethnically’ Sikh with the development of ‘search-as-you-type’ functionality online, which will assist those who want to fill the ‘other’ box under ethnicity. He confirms data outputs from both religion and ethnicity will be analysed and will, ‘increase the analytical offering and outputs for those who identify as Sikh.’ He also confirms there is a commitment to utilise the Digital Economy Act 2017 for data linking research purposes, so information about Britain’s Sikhs will be available across public services, not just Census collected data. There are other clear commitments which aim to improve data collection beyond purely the Census, whilst encouraging collaboration with local authorities and British Sikhs. The ONS want to improve data collection and promote wider Census participation, as well as ‘raise awareness of the options of writing in their identity in the ethnic group question’. We are surprised Preet Gill MP or the SFUK run APPG for British Sikhs have failed to mention this accommodating and conciliatory letter. The offer to help Sikhs who would still like to be categorised under a Sikh ethnic group is serious and goes much further than expected. It appears they are so obsessed with a tick box, they have lost sight of their initial goal.